Adam Ekberg, ''Arrangement #2,'' 2010, archival inkjet print, 40 x 30'', at Platform Gallery. For photographer Adam Ekberg, light is both subject and object. He employs medium- and large-format film cameras to capture what look like casual domestic scenes, which are, in fact, carefully staged tableaux. A single glinting soap bubble is caught in the blades of a lush green lawn. A man’s shadow is cast on a fence, and, just where his eye would be, another eye peeks through a knothole. (Unable to locate just such a knot hole-bearing fence near his Tampa, Florida home, Ekberg built the fence himself.) Colorful balloons hang suspended in a bare, furniture-less living room, like the partially deflated remains of a defunct party. Ekberg’s work possesses a distinct melancholy, often depicting objects that can be found in that most transient and anonymous of places — the convenience store. He uses cigarette lighters, disco balls, and flashlights, both to illuminate the work itself and as objects that carry the narrative. One of the strongest pieces, “Arrangement #1,” depicts two flashlights shining at each other, creating a reflected double glow between them. 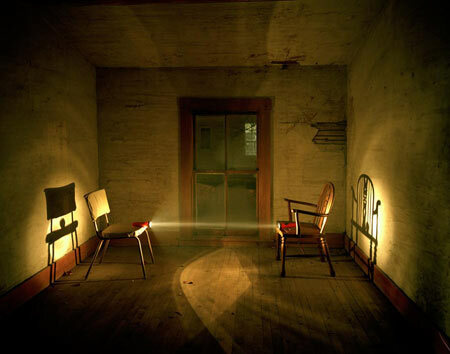 Two arcs of light meet and overlap to form a pointy-edged oblong shaft across the floor on which are scattered leaves in a kitchen populated with old chairs and suffused with a warm glow. Reminiscent of Nan Goldin’s photograph, “Valerie in the light, Bruno in the dark,” Ekberg's light similarly strikes and bounces in the dark room. It is as though we have been invited into a sacred secular space. In another quiet moment, we see reflected in a bathroom mirror a man’s wet hand reaching toward its own reflection, calling to mind Michelangelo’s “Creation of Adam.” Here, though, we find an unremarkable shower curtain reflected in a mass-produced vanity and only the single hand captured twice. There is no god. Working in film, such manifestations of light reveal themselves to Ekberg only afterwards, in the processing. Other photographs contain the chance capture of lens flare: glowing circles not seen by the naked eye, the products of the camera lens itself. Ekberg scans his negatives and prints digitally, without any additional Photoshop manipulation. The scenes may be carefully contrived, but the processing is designed to etch the a single moment, in all its lucky happenstance and accidental beauty. Ekberg makes much of small, mundane moments. A backyard, an old house, a bare living room, a closet: these domestic spaces are lonely and, for the most part, devoid of people. From the glow of a cheap flashlight or a single tiny candle, to the repeated bouncing of light-jots from a disco ball, the light remains a character here and it is gorgeous, falling in pools and washes, glinting off mirrors, and caught in scenes that won’t last long.